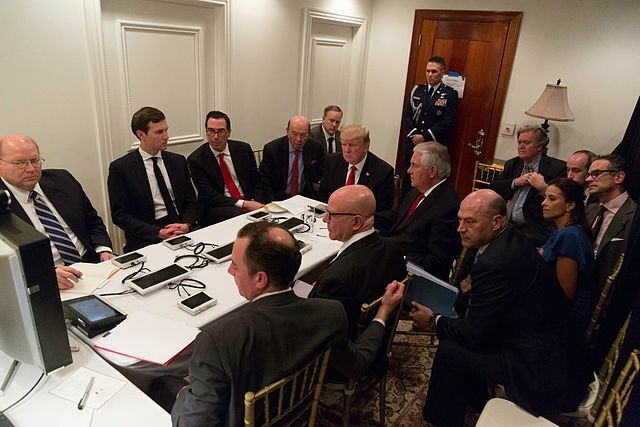 When the gullible and insouciant American public and the presstitutes who participate in the deceptions permitted the Deep State to get away with the fairy tale that a few Saudi Arabians under the direction of Osama bin Laden, but without the support of any government or intelligence agency, were able to outwit the entirety of the Western Alliance and Israel's Mossad and deliver the greatest humiliation in history to "the world's only superpower" by making the entirety of the US government dysfunctional on September 11, 2001, Washington learned that it could get away with anything, any illegal and treasonous act, any lie. The gullible Western populations would believe anything that they were told. Not only insouciant Americans, but much of the world accepts any statement out of Washington as the truth despite the evidence. If Washington said it, Washington's vassals in Germany, France, UK, Canada, Australia, New Zealand, Netherlands, Belgium, and Japan assent to the obvious lie as if it were the obvious truth. So do the CIA purchased media of these vassal states, a collection of whores who prefer CIA subsidies to truth. When Obama inherited the Deep State's agenda from George W. Bush, he set up Syria's Assad for regime change by repeating for many months that if Assad used chemical weapons in the "civil war" that Washington had sent ISIS to conduct, Assad would have crossed the "Red Line" that Obama had drawn and would, as the consequence, face an invasion by the US military, just as Iraq had been invaded based on Washington's lie about "weapons of mass destruction." The Russian government also took a firm stand, admitting that Russia stupidly trusted America in Libya, but no more. We, said the Russians, will ourselves remove any and all chemical weapons from Syria and turn them over to Western "civilization" to be destroyed, which the Russians did. What did Western "civilization" do with the weapons? They gave some of them to ISIS. This gave Washington a second chance to accuse Assad of using chemical weapons "against his own people." And so Washington has rolled out this hoax a second time. During a Syrian air force attack on an ISIS position, a chemical weapon exploded, or so it is alleged. Instantly Washington said that Assad had used "Sarin gas against his own people." Trump was shown photos of dead babies and stupidly ordered a US military strike against Syria. This was the first time that Washington had engaged in an unambiguous war crime without any cover. Trump had no UN resolution, not even one that could be stood on its head as in Libya. Trump had no NATO participation, no George W. Bush "coalition of the willing" to give cover to the war crime with the support of other governments. There are no skirts for Trump to hid behind. He stupidly let himself be pushed into committing an unambiguous war crime. Now all his opponents--the Deep State, the military/security complex, the CIA, the Hillary Democrats, the warmonger Republicans--have the New White House Fool under their control. If Trump doesn't do as they want, they will impeach him for his war crime. Meanwhile the risk of war with the Russian/Chinese/Iranian/Syrian alliance grows closer. The US shows every intention of provoking this war. Washington has imposed sanctions on 271 employees of Syria's Scientific Studies and Research Center for, in Washington's lying words, responsibility "for developing and producing non-conventional weapons and the means to deliver them." In order to make this false charge stick, Washington prevented any investigation whatsoever into the facts of the alleged chemical weapon associated by Western propaganda, not by any known fact, with a Syrian air attack on ISIS. If Washington is so certain that Syria is responsible, why does Washington block an investigation? If Washington is right, an investigation would prove Washington's case. But as Washington is again lying through its teeth, an investigation would prove the contrary. And that is what Washington fears and is the reason Washington blocked an investigation. Are Western populations intelligent enough to understand that the only reason for Washington to block an investigation of the alleged use by Syria of a chemical weapon is that the facts clearly do not support Washington's lie? No, they are not. The Russian explanation is that the Syrian air force attack hit a storage facility, conveniently arranged by Washington, that contained chemical weapons. I have seen reports that Washington, or Washington's vassals such as Saudi Arabia, have provided ISIS with chemical weapons. President Putin of Russia says the reason Washington has delivered chemical weapons to ISIS is that there can be more orchestrated instances of their use that can be blamed on Assad. I think I can say in complete confidence that this is what is happening: Washington intends to wear Russia down with orchestrated chemical attack after chemical attack, portraying Russia as an inhuman defender of Assad's alleged chemical attacks, in order to more thoroughly isolate Russia and in order to provoke opposition to Putin's government, especially among the US and German financed NGOs that Russia stupidly permits to operate in Russia and in the Russian media. Washington's goal is to force by the weight of world opinion Putin to abandon Assad to Washington. US Secretary of State Tillerson, another gigantic disappointment to those who hoped for peaceful relations between the US and Russia/China/Iran/Syria, has said that the US still intends regime change in Syria. Tillerson has advised Russia to get out of Washington's way and to "consider carefully their support for Bashar al-Assad." This is Washington's game plan. I am certain Putin is aware of it, and I think the Chinese are, despite their inordinate focus on making money. The questions before us could not be any clearer: Will Russia and China break and give in to Washington? If not, will Washington become a good world citizen for the first time in America's history, or will Washington issue more threats, thereby convincing Russia and China that their alternative is to wait for Washington's preemptive nuclear strike or deliver one themselves? under President Ronald Reagan. You can read more of his columns and find his books at PaulCraigRoberts.org.